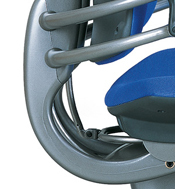 Freedom to Move - The Freedom chair was designed specifically to encourage frequent, spontaneous changes of posture. There are no locks and no tension springs to negotiate. In their place are elegant mechanisms that automatically support your body in every position you’ll assume throughout the day. Technology can make simple things complicated or complicated things simple. We prefer the latter. The Freedom chair is designed to give the maximum ergonomic benefit to the sitter with a minimum number of manually-adjusted controls. Once the chair is fitted, no further adjustment is required. The idea is that movement, which is essential for a healthy body, should not be constricted by locking mechanisms and manual controls. In other words, sitting comfortably is not something you should have to think about. 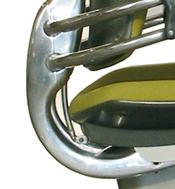 Revolutionary armrests move in tandem to eliminate the dangers of uneven arm positioning. 6" range of vertical motion to accommodate all users and tasks. Can be positioned below thigh-level for close table or desk work. Techno gel armpad for superb comfort. Position-sensitive headrest moves into place when you recline and out of the way when you sit upright. 5" vertical adjustment to fit all users. Moves in the natural arc of head/neck for perfect support through range of recline. Contoured to cradle the head and neck in comfort. 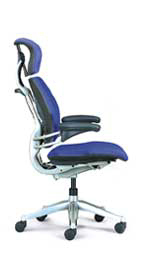 Backrest / Lumbar Support Height: 3" adjustment range. Shipping Dimension (L x W x H): 27" x 27" x 35"
Winner of 10 international design awards for its many revolutionary features and unparalleled ease of use, Freedom’s groundbreaking design is the gold standard by which other chairs are judged. 1. Automatic Headrest: Freedom’s dynamic, position-sensitive headrest adjusts to cradle your head and neck as you recline, and moves out of the way when you sit upright automatically. 2. Recline Action: As you recline, you’ll maintain a near-constant eye level, while the angle between your torso and legs opens up for better body function. 3. Contoured Cushions: The cushions are sculpted to closely follow body contours, which increases contact and decreases concentrated loads. Our optional Technogel seat cushion maximizes weight distribution and comfort. 4. Responsive Backrest: The pivoting backrest automatically adapts to the changing needs of your spine during recline. 5. Synchronous Armrests: Freedom’s body-friendly gel armrests move up and down together and stay with you during recline, always keeping you in supported balance. 6. Body Fit: The seat, backrest and headrest may be independently positioned to fit your exact body size. 7. 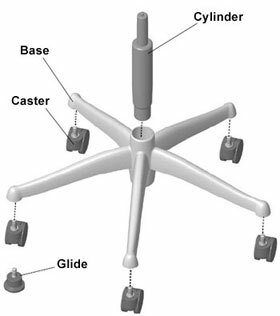 Intelligent Mechanism: With Freedom’s revolutionary counter-balance mechanism, your weight automatically balances the force required to recline the chair. So whether you’re big or small, short or tall, the recline tension is always perfectly adjusted to let you move while keeping you fully supported in all positions. Freedom and the Environment - Humanscale is committed to environmental sustainability and continually strives to design, engineer and manufacture products that compared to others in the same class - consume less of the Earth’s limited resources. 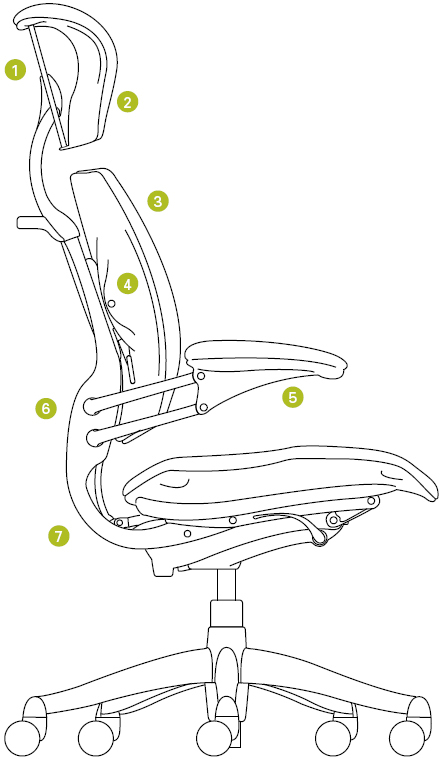 The Freedom Chair is a great example of Humanscale’s environmental purpose. The Freedom chair is Greenguard-Certified and can help a project achieve LEED-CI certification in a number of areas. Consult your Humanscale representative for additional information on earning any of the LEED-CI credits detailed here. Note: Entire frame is cast in aluminum. There is no difference in hardness between Graphite and Titanium as they are both powder coated colors over aluminum. Polished Aluminum means that they didn't paint the aluminum frame but they polished it. Created by award-winning designer Lori Weitzner, Squiggle was inspired by the movement of ripples across a still body of water. Squiggle features an innovative weave structure that creates a modern, organic wave pattern. The design comes in nine rich color ways, and can be applied either horizontally or vertically to Humanscale seating. To clean Squiggle, apply a water-based shampoo or foam upholstery cleaner and take care not to saturate the textile with water. To maintain the integrity of the fabric, an environmentally friendly cleaner like Simple Green Carpet & Upholstery Cleaner is preferred. Composed primarily of renewable merino wool, Bridget stripe offers a five-color 50-stripe pattern with shifting color sequence that creates an undisrupted movement across the surface of the fabric. Boasting exceptional durability for a wool textile, Bridget stripe may be applied either horizontally or vertically to Humanscale seating. This Ultraleather textile from Ultra fabrics is environmentally friendly, wipeable and antimicrobial, and ideally suited to healthcare, hospitability and industrial applications. Made without PVC, Promessa has a pebbled, highly textured finish that will work beautifully in a wide variety of environments. Ultraleather Promessa cleans effortlessly with soap and water. Most stains can be lifted with alcohol-based solutions like Fantastik and Formula 409. Promessa disinfects with 5:1 bleach ratio. By partnering with Spinney beck, Humanscale is able to offer the finest leathers available for its seating. Dust regularly. Minor spots can be washed off with lukewarm water and mild soap. Do not soak. Never clean with abrasive solvents, alcohol or wax-based products. Approved maintenance products are available from Spinney beck. Cervo is thicker than the other leathers in our collection. Specialized milling adds additional character providing a soft pebble grain texture unmatched by any other leather in its class. High 8" Cylinder (F): Adjustable Height range (20.5" - 28.5") from Floor with 18" foot ring. High 8" Cylinder (R): Adjustable Height range (20.5" - 28.5") from Floor with 21" foot ring. Natural lift and release action for immediate repositioning without buttons or locks. 6" range of vertical motion to accommodate all users and tasks. Can be positioned below thigh-level for close table or desk work. Attached to backrest so arms stay in same relation to body during recline. Technogel armpad for superb comfort, Duron Cover. Same height adjustment features as Standard Armrests. Also pivot at elbow for width adjustment. Lockable in 5° increments. Automatic unlock feature when positioned inward and user wishes to exit chair. 1.25” longer than Standard Armrests for additional forearm support. Question: What is the seat height range for this chair? Answer: The seat height range is 20.5 " - 28.5".